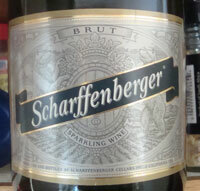 Scharffenberger Cellars, sometimes misspelled Scharfenberger, makes two sparkling wines using the traditional méthode champenoise, where wines undergo their secondary fermentation (the ones that makes the bubbles) in the bottle. Their wines are a great value, with a Brut available for well under $20 ($14 sometimes) and a Rose at the $20-$25 dollar mark. And don't discount them because of their low price: this is quality juice! They are in Anderson Valley and were founded in 1981 by John Schraffenberger and were temporarily known as Pacific Echo from 1998 to July 2004. The Anderson Valley is near the ocean, has good drainage, has warm days and cool nights and is often fog shrouded - ideal conditions for slowly yet fully maturing grapes. Schraffenberger has 120 acres under cultivation in the Anderson Valley and also has good long term relationships with other growers in the Mendocino County for additional grapes. Tex Sawyer has been the winemaker since 1989, not surprisingly from Texas. He never expected to be involved with wine production, but got a Masters in food science from UC Davis, with a specialization in enology, after becoming interested in wine making. He lives near the winery and is in charge of winemaking and production, and probably has a Texas accent although I haven't met him yet! Scarffenberger Brut - This wine is 2/3 Pinot Noir and 1/3 Chardonnay made using the traditional méthode champenoise and spends about 2 years on its lees.. The base wines have full malolactic fermentation. See the tasting note below. Scraffenberger Brut Rose - This wine is 54% Pinot Noir which includes the additional of 4.5% still red Pinot Noir for color and46% Chardonnay. Most of the base wines have malolactic fermentation completed making the wine soft, the traditional méthode champenoise is used, and the wines spend 2 years on their lees. At about $17 (I paid $14 on sale) this is a pretty wine and a great deal. The nose is delicate with lemon and lime notes and a slight marine/ocean note I enjoyed. On the palate it is crisp and clean with a little lime and apple with air. Although this wine is not at all thin, it does not have much weight nor complexity but it is pretty, especially at its price point!